The O&P Business Management Certificate is a comprehensive certificate granting program that offers a series of business and management seminars to provide business managers, practitioners and distributors an opportunity to explore crucial business challenges—from finance, sales and marketing to business operations, reimbursement policies and management. The improved Business Management Certificate Program is similar to non-degree continuing education programs that universities offer in conjunction with their MBA programs. 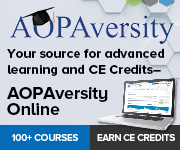 The Certificate Program courses will be offered at the AOPA Assembly, online at AOPA’s website and targeted seminars throughout the country (such as the Mastering Medicare: Essential Coding and Billing Techniques Seminar). Select and complete four (4) required core modules and four (4) elective modules within four (4) years and pass a Module specific quiz for each program. If you have completed a course, the next step is to complete the quiz. Email Ryan for the quiz link. Participants that successfully complete the program will be awarded a certificate of completion, in addition to being recognized at the AOPA National Assembly and the O&P Almanac. The AOPA Business Management Certificate Program focuses on four subject areas: Finance, Management, Sales and Marketing, and Operations. To complete the program you must complete the required core module and one elective module from each of the four subject areas for a total of eight courses. This two-day seminar is offered 3-4 times per year at locations around the country. The participants of the Program will receive a distinguished certificate of completion once they have completed eight (8) of the Business Management Program Modules and passed a Module specific quiz. A variety of Modules will be offered of which four (4) core required and four (4) core elective must be completed. Module specific quizzes will be submitted to AOPA upon completion of the course. In order to receive credit for a course, a participant will be required to pass the course specific quiz with a grade of 80% or higher. Participants will have one re-take opportunity if they do not pass the quiz. There is no cost to sign-up for the program; you are responsible only for the individual courses. The total cost of earning your certificate will vary depending upon the courses you choose.